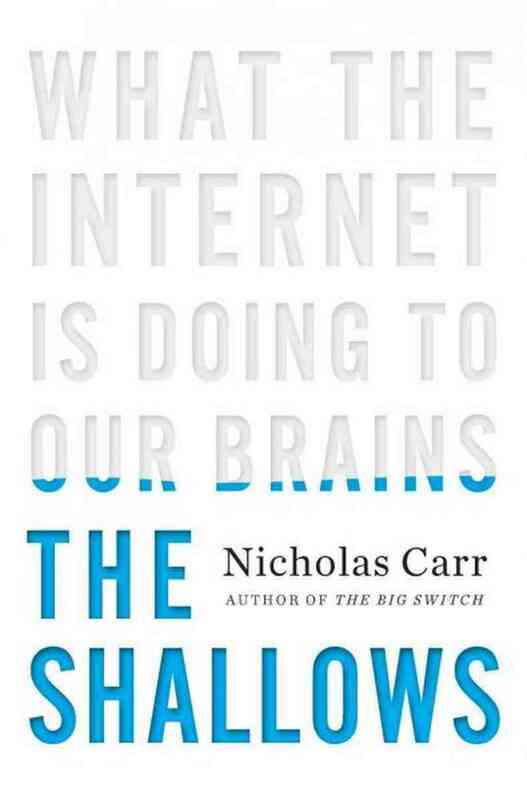 My initial reaction to the book “The Shallows”, by Nicholas Carr is that it paints a very negative picture of using the internet. I have a hard time with this as I love using technology personally and in my classroom. Although, I think it is important to be conscious of how the internet can affect us, it is counterproductive to dwell on the negative. When Carr writes about all the distractions the internet brings with it, I get that. While I read this book on my Kindle app, my notifications for Twitter, email and Facebook kept popping up. It was so tempting to click on those pop ups. To avoid the distractions, I turned off my notifications while I continued to read. Then the most distracting thing happened, my mom came in the room, turned on the TV and wanted to talk. It is not only the internet that distracts us. Now, instead of turning off my internet distractions, I now had to turn off my face to face ones too! Rather than dwell on the negative aspects, I choose to use them as teachable moments in my classroom. Last year when asked by my students if they could listen to music while working on their computers, I agreed. We talked about the pros and cons of listening to music while they worked. Some students said that listening to music helps them focus on their work by drowning out the voices of others talking. Some said it depended on what music it was, if it had words or was just instrumental. Others indicated if they were writing they needed quiet, but if it was math work they preferred listening to music. It of course did not go smoothly right away. All the students wanted to listen to music in the beginning. Some brought iPods while the other listened to YouTube. Some of the students who chose music from YouTube found they were distracted as they focused too much time on selecting songs and switching them. Some ended up finding that the music was distracting during different tasks. However, all these things were discovered by the students actually having the opportunity to experience it. Yes, it may have been easier for me just to say no, but instead I choose to use the opportunity for my students to learn about how to deal with the distractions. These are things that they are dealing with outside of school already. I think it is our responsibility to help guide our students in using these tools positively and productively. They will not just figure out this part out on their own. Does the internet encourage shallow learning? I am not sure I agree with Carr on this point either. It depends on how you use it. Two years ago, I started using Twitter for professional development. It is a tool I use to connect with other educators that have the same passions as I do. I read the articles they are reading as well as their blogs. I have even started my own professional blog where I reflect on my practice and get feedback from others. With the experience I had with Twitter and blogging personally, I now use these same tools with my students. Through Twitter and blogging students can connect with field experts, authors, classes from around the world and more. My students can reflect on their learning to make it visible not just for me but to their parents. If you make them public, to the world, these people can then give feedback and ask questions that push the students’ learning even further. When my students published their work to the public it made them be more mindful of what they were putting out there for the world to see. When feedback was given by someone other than me, their teacher, they took that more feedback seriously. As much as I would like to think I motivate students with my own feedback, something about getting feedback from others seemed more powerful to them, it seemed more real. These are all things that would not be possible without the internet. I will admit that I am an early adopter when it comes to technology. This book was a good reminder to stop and think about how and why I use technology personally and in my classroom. It also made me reflect on balance. Do I have balance in my life when it comes to technology? Sometimes this answer is yes, sometimes it is no. It also made me think of ways I could bring more balance and take a step back from the big bad internet! Did you read it? Tell me your thoughts in the comments.